Update: We’ve added DJI Osmo Pocket footage below to better demonstrate our first experiences with the pocket-sized gimbal. We’ll continue uploading video – including 4K footage – as we field test the camera. DJI Osmo Pocket is poised to be the easiest way to record stabilized 4K video without having to carry around a full-sized DSLR gimbal and bulky camera gear. It’s a handheld camera stabilizer for the mainstream, and that means you’ll soon be seeing even more silky smooth video out there. That’s a good news for everyone. 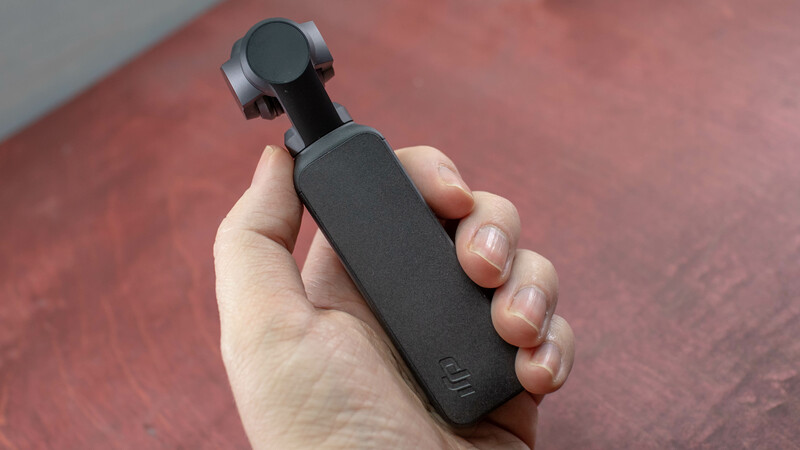 Since this a mainstream device, let’s explain: a gimbal, like the Osmo Pocket, works by adjusting for your shaky hands and bouncy walking patterns by counteracting your uneven movement with its own motion. This wand-shaped handle with a camera on top can also pan and track shots thanks to some camera controls and smart software. The smoothness of resulting video has the potential to be stunning. Think: it’s like an old giant Hollywood crane that offers smooth video, but reduced to the size of a compact flashlight. Our hands-on time with the DJI Osmo Pocket has so far been limited. Here’s what we think of the pocket-sized gimbal so far. The DJI Osmo Pocket release date is December 15, with pre-orders having started as soon as it was announced, on November 28. While it launches after Black Friday and Cyber Monday, DJI is clearly trying to get its new gimbal out there before Christmas. It’s just one extra present option for you to consider this holiday season. It costs $349 (£329, AU$599), which is cheaper than competing camera, the GoPro Hero 7 Black. This year’s new GoPro has image stabilization built in, so there’s some overlap between the two devices. Their applications are fairly different, but the fact that they both use a lot of accessories (that cost extra) and result in stabilized footage makes them comparable at the end of the day. 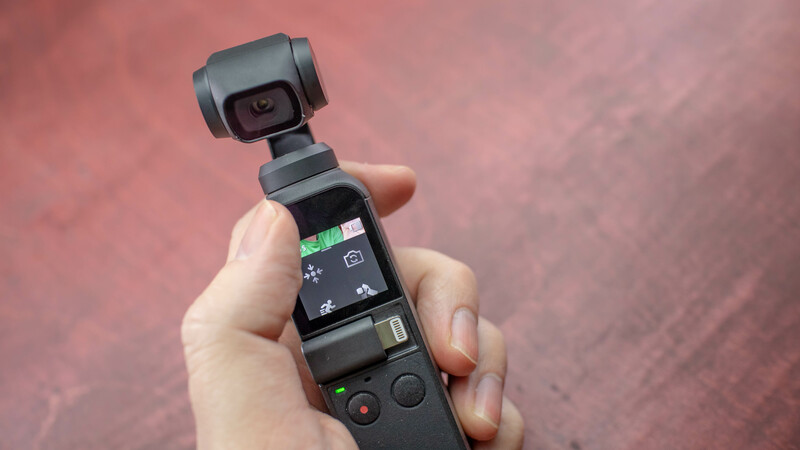 The DJI Osmo Pocket packs a lot of gimbal stabilizing technology into a tiny package, measuring 121.9mm x 28.6mm x 36.9mm and weighing 116g (4oz). It’s definitely pocketable, even when inside the included case (and DJI recommends always using the case when transporting the gimbal). 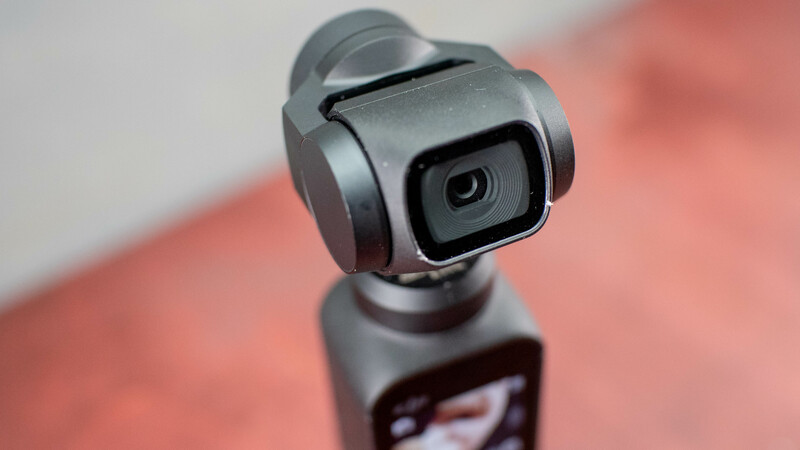 It’s almost a miniaturized version of the DJI Osmo 2, and unlike the DJI Osmo Mobile 2 launched earlier this year, this gimbal won’t hog your smartphone. It comes with a camera mounted on top. You can attach your phone for a bigger viewfinder. There’s a useful, but small one-inch screen on the gimbal handle to frame shots otherwise. Below is the first DJI Osmo Pocket footage we captured coming back from the NYC launch event. The video is shot in 1080p (change the settings if it says 720p), as 1080p is the default setting out-of-the-box. However, it does record in 4K, so we’ll continue testing the quality in our full review. The Pocket is equipped with three motors: a tilt motor, roll motor, and pan motor to even out your shaky video. They all work to counteract your movement, and it seems to work well on such a small device in our early testing. It will take gimbal novices (a targeted demographic for this device) some practice to get used to the modes. There are three main gimbal modes: Follow Mode moves with you and smooths out your uneven movements, Gimbal Lock mode keeps the camera locked in its current horizontal position ideal for up and down movement, and new FPV Mode follows your every tilt, turn, and rotation to mimic an action cam. And then there the different recording types and various controls. Besides video, you can take slow motion video, time lapse video, and motion lapse video. The latter combines timelapse video with pre-set movement using the gimbal. The camera also snaps photos and can stitch together panoramic stills. Selfie mode is executed by press the handle’s mode button three times, and doing it again returns to to center. We found the mushy button to make this a bit difficult, and everything easier to control with a smartphone attached. From there, intelligent features like FaceTrack and ActiveTrack really help – though you can FaceTrack two faces in a frame. Someone is always the lead face. There’s a bit more to explore among the modes, including a new Story Mode that automatically splices together videos from throughout your day using trendy-looking zoom-in and camera whipping transitions. It’s all done automatically and the DJI app can add music to the final clip, too. Connecting a phone was easy, as the box included Lightning and USB-C adapters, They slot right into the handle, though the phone is rather unsecure. You can’t hold the rig by the gimbal, as our iPhone XS Max nearly fell to the ground. We found the onboard microphone picked up our voice while walking in a subway, which is ideal for vlogging. We don’t expect to be be amazing in places that are any louder, and the sound did cut out whenever the decibel levels were too high around us – basically every time the drummer at an impromptu concert hit his cymbals. Finally, the DJI Omso Pocket has a 875mAh battery, and it isn’t replaceable. That means you’ll need to carry a power bank to get a full day’s use of this tiny gimbal. DJI says it’ll last two hours recording 4K video at 60fps (lower resolutions may give it extra recording time), and it takes one hour to charge it back to 100%. 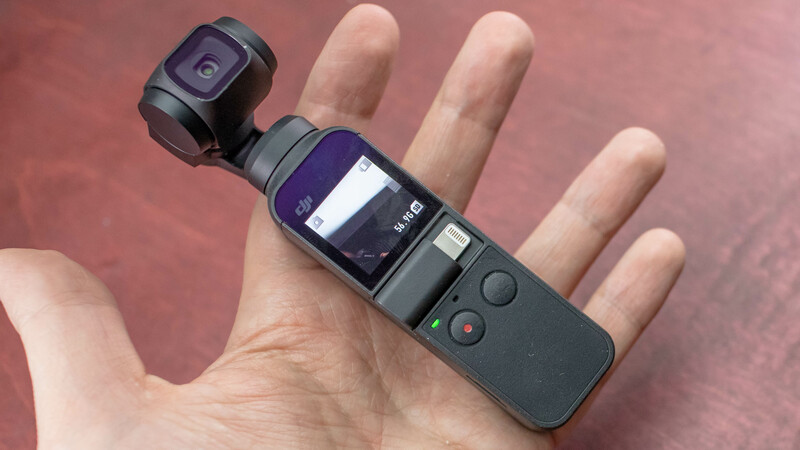 The DJI Osmo Pocket is small, but the specs still offer high resolutions and frames per second, superior to what you’d expect from a pocket-sized all-in-one gimbal. It has a 1/2.3-inch CMOS sensor, like DJI drones prior to the DJI Mavic 2 Pro, and can record video 4K video up to 60fps at 100Mbps. It’s interesting that 60fps is here at the 4K resolution when DJI’s consumer Mavic drones can’t do that currently. We’re still getting a handle on video quality, stabilization when walking, whether or not it can autofocus well when we’re on the go. That’s going to be key. We also want to see how it handles low-light situations. So far, slow motion record at 120fps, but a lower resolution. You’re going to get some inevitable grain, just like you do on your smartphone, but you’re still going to get smoother video. We’ll update this section when we’ve recorded more videos and snapped more photos using the DJI Osmo Pocket. The DJI Osmo Pocket is the all-in-one solution for anyone who wants to capture fluid video, but doesn’t want to dedicate a portion of their backpack to carrying around something much larger, like the DJI Osmo Mobile 2 or the DJI Ronin S.
It’s a pocket-sized gimbal with impressive stabilization – if you’re not looking to shoot a cinema-level production. And yet the DJI Osmo Pocket video resolutions keep up with its bigger counterparts. Recording fluid 4K video at 60fps is fully possible here and the DJI app actually cuts together good video compilations. At $349, it competes with the GoPro Hero 7 Black, which uses in-camera stabilization. But while GoPro has described its camera as having gimbal-like stabilization, DJI is offering true physical stabilization without cropping your frame. We’ll see how that pans out (and tilts and rolls) in our full DJI Osmo Pocket review. 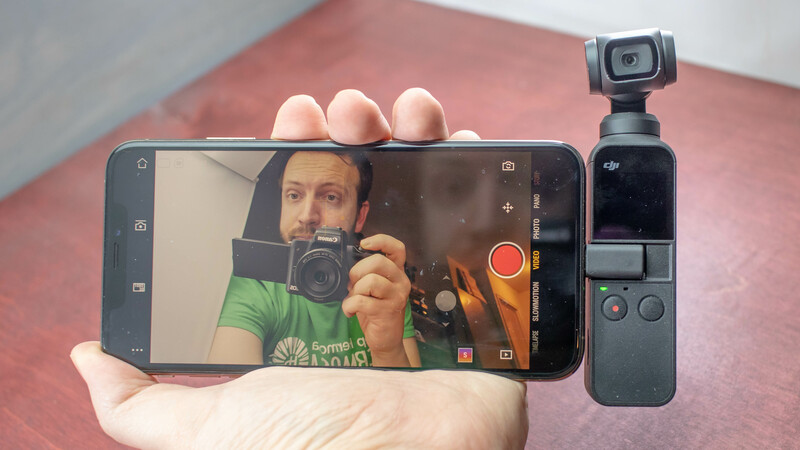 There’s a lot of promise in this pocket-sized DJI gimbal, even if the amateur vlogger audience it’s truly ideal for may hesitate at its current asking price.